P. Fred Armbruster, 90 of the North End section of Wilkes-Barre, passed away Sunday afternoon, March 31, 2019 at the Wilkes-Barre General Hospital. Born in the East End section of Wilkes-Barre, he was the son of the late Carl and Marie (Monahan) Armbruster. 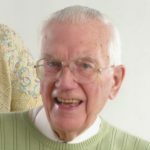 Fred attended James M. Coughlin High School, Wilkes-Barre, and was employed as a sales representative at Harris Hardware, Anthracite Supply and last for Graber Industries until his retirement. Fred was a member of St. John the Evangelist Church, North Wilkes-Barre, until its closure and merger, and currently a member of Corpus Christi Parish, West Pittston. While a member of St. John the Evangelist, Fred was a member of the Holy Name Society, was a lector and Eucharistic Minister, was a member of the St. John’s 300 Club, and a Cub Master at Cub Scouts Pack 90, St. John’s. Fred was also a 4th Degree Knight of the Knights of Columbus, was a member of the Serra Club, and volunteered at Meals on Wheels. He was preceded in death by his brother Carl William Armbruster, who was a casualty of the PA 109th Field Artillery train accident on September 11, 1950, sisters Louise Armbruster, Marie Nagle Jones, and Claire Rutcosky. Surviving are his wife of 65 years, the former Ann Marie Roarty, daughter Mary Beth Sanguiliano and her husband Nicholas, Wilkes-Barre, sons Fred Armbruster, Wilkes-Barre, Carl “Bill” Armbruster and his wife Suzanne, Long Valley, NJ, Daniel Armbruster and his wife Amy, Harvey’s Lake, and Donald Armbruster and his wife Josephine, Rock Hill, SC, grandchildren Nicholas Sanguiliano, William Sanguiliano, Andrew Sanguiliano and his wife Amanda, Christopher Armbruster, Leighann Armbruster, and Daniel Lloyd Armbruster, Great-Grandson Rider Johnson Sanguiliano, sister Eileen Spagnola, Wilkes-Barre, numerous nieces and nephews. Fred’s family would like to thank the doctors and nurses at the Wilkes-Barre General Hospital, specifically Dave from telemetry, and Gary, Amanda, and Tom at the ICU for providing compassionate care for their father. They would also like to thank the staff at Fresenius Dialysis Center for the care they provided over the past year and a half for Fred. A Mass of Christian Burial will be held Thursday, April 4, 2019 at 10:00 am at Corpus Christi Parish, Immaculate Conception Church, 605 Luzerne Avenue, West Pittston, PA 18643, with Monsignor John J. Sempa, Pastor, officiating. Interment will be held at the convenience of the family. Family and friends may call Wednesday from 5:00 to 7:00 pm at the Corcoran Funeral Home, Inc., 20 South Main Street, Plains, PA 18705. Memorial donations may be made to Corpus Christi Parish Social Concerns Committee, C/O 605 Luzerne Avenue, West Pittston, PA 18643 in Fred’s memory.